← Day 72: Get a Spray-on Tan. Some dear friends from high school were visiting me from out of town for the weekend. We had a bit of a slow start to the day due to the previous night’s shenanigans, yet we still managed to enjoy a leisurely brunch on a nearby patio, before miraculously arriving a touch early to the grandiose Spa at the Elmwood. Oh, the hardship! Being somewhat of a spa enthusiast, I was delighted to find something new to me on the list of available treatments: namely, a Reiki massage. Now, I’ll be perfectly honest, having been raised in the school of ‘no pain, no gain’, the concept of a potentially hands-free rub down struck me as a considerable waste of money. But then I remembered to bring a gift card that I had received at Christmas, and an open mind, so it was all good. We began our stay by frolicking in the water therapies, which consisted of a unisex steam room, hot tub, and pool, followed by another steam room, hot tub and rain showers in the recently renovated women’s change room. Sigh… We then dragged our already jello mellowed bodies to our respective appointments, where I met my practitioner, David. He seemed very wise beyond his twenty-something years, with a pleasant demeanour and healthy sense of humour, as he patiently and cleverly answered my barrage of questions. I liked him immediately. I learned that Reiki has a surprisingly wide variety of factions that all fall under two major branches: Traditional Japanese Reiki, and Western Reiki. The major difference is that the Western version follows a pre-set pattern of hand positions, rather than an intuitive skill of merely knowing where the hands should be placed. David further explained that the hands-on or hands-off decision is really an individual preference of the therapist, but that the hands-on approach, which he uses, seems to be the more effective of the two. We began with me lying face down, trying hard not to squish my mink eyelashes on the headrest. He positioned his suddenly blazing hot hands on the top of my head, also known as the crown chakra. After a few minutes, he moved them slowly down my meridian line, pausing over each of my other 6 major chakras. This was then repeated with me lying on my back. He gave me ample warning, checking in with me prior to each change in hand position. Interestingly, he also mentioned that my throat chakra seemed to draw his hand to it like a magnet, which was consistent with something my tantra instructor had highlighted. Hmm… Maybe there was something to this after all. We had a few minutes left towards the end of the session, since, besides my throat, I seemed to have fairly decent energy alignment, thanks in no small part to my newly stress-free lifestyle, so David took the opportunity to do a little deep tissue work on my sore neck. Ah, sweet relief! While the Reiki had inexplicably felt wonderful, I can’t say that it delivered nearly the same results as a good old-fashioned kneading. But maybe that’s just me. Reiki is defined as a spiritual practice, that transfers universal energy for self-healing and equilibrium from the practitioner to the recipient; however, from a scientific perspective, its benefits are still unproven, although it has never been shown to cause any ill effects. 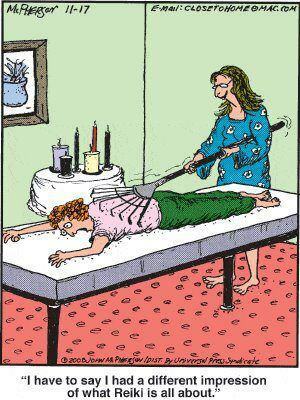 The word Reiki has been translated as anything from ‘mysterious atmosphere’, to ‘universal life energy’. In Ireland, most people would simply call it ‘jiggery-pokery’, but even if it only delivers a placebo effect, there is no real harm in that. The most surprising thing I learned, besides the fact that Reiki can trigger emotional releases, was that it can also be done remotely – we’re talking even across the country! This is known as ‘distant healing’. David himself has done this, and admits it sounds a little crazy, but we are all connected, and it seems to work. I simply focused on keeping my mind open to the concept. Later on, I read more about some of the practice’s major principles, which include: inviting happiness, not being angry, not worrying, being grateful, working with diligence, being kind, and praying with an open heart. Don’t worry, be happy? Yep, I like the sound of that. Don’t mind if I do. This entry was posted in Health and tagged health, massage, May, Reiki, Spa at the Elmwood, Toronto. Bookmark the permalink. 1 Response to Day 73: Get a Reiki Massage.